Hi there, thanks for stopping by. A quick spiel about me and how I got started making furniture. 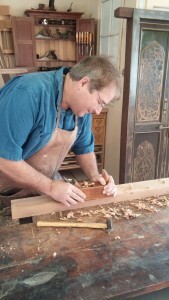 I was born and raised in Salt Lake City, Utah and began working with furniture in 1981. My early experience was working for Vintage Arts, a family owned business that was started in 1967, restoring antiques and finishing furniture. I received my Bachelor of Fine Arts degree from Utah State University in 1990 after which I continued to hone my skills in restoration. During this period between 1990 and 1998, I educated myself in the building of furniture, utilizing my skills in restoration as a basis. In 1998, I established C. Timm Custom Furniture, LLC. My work is mostly commission based, building new designs or making reproductions of various period furniture. My focus is on making the best product possible no matter the size of the piece, so I assume responsibility for the entire project from initial drawings to the final finish. I take pride in using the highest quality products and using the best joinery available for the job. I want to share my passion for building, finishing and restoration, so I offer periodic workshops at my studio to instill in others the skills and excitement in the craft of wood working. You can find more about the classes that I offer on this website. I was also recruited by Salt Lake Community College, a rather large community college located here in Salt Lake City, to teach and assist classes in refinishing, building and engineering the electric guitar. Building custom furniture has been very exciting and satisfying for me over the years. I am able to produce your individual piece with quality of craftsmanship. Send me a message and let’s talk about what’s on your mind.